Recently, I was asked for advice about how to respond to the parents of a child diagnosed with cancer. Let me say from the outset that I am a dubious source whose council typically causes some manner of regret. However, since I have stood on the receiving end of some pretty stupid comments over the past year, I do have a fair amount of expertise in this particular area. First, THERE ARE NO MAGIC WORDS, so don’t try to find them. When one is at the start of a long, twisted road that includes the potential mortality of their child, words simply cannot soothe. They can, however, aggravate. So I thought it might be helpful to look at some things that struck us the wrong way when we were facing our crisis. 1. Do not equate anything you’ve gone through (or had a third cousin go through) with their situation. This is an immediate conversation ender. We once had someone compare a month-long sinus infection to Kylie’s cancer. 2. One of the most frequent things we heard was, “What can I do?” No matter how sincere the offer, this can add stress to an already stressful situation. The parent of a recently diagnosed child has no idea what day it is or if they remembered to change their underwear for the past two weeks, so they will most likely have trouble assigning tasks to the three dozen people who have asked. Vague offers of help only muddle already murky waters. 3. By far the worst statement I got was, “I know how you feel.” Uh, no you don’t. Get back to me when you watch the rise and fall of your child’s chest wondering if it will stop during the night. And even if you have been there, your feelings and mine are totally different things. 4. Watch your quantity of words. Parents in this situation have a maximum amount they can absorb before they shut down. Docs usually fill that bucket daily. 5. Persistence can be irritating. There were weeks that passed when we just couldn’t answer texts and emails. It didn’t mean anything other than we were focused on greater issues. A second or third text reminding us of the original only made us feel bad for our inability to balance everything. 6. Don’t expect to assume a role that you didn’t have before diagnosis. If we haven’t spoken in years, I likely have someone else to bare my soul to. It is fine to offer especially if you have dealt with similar issues, but don’t expect it. 7. Don’t badger for information. We would have loved to have known specifics, time frames, and end dates. Unfortunately, these often don’t exist in the cancer game and constant demands for information only serve to remind a parent of their helplessness. 8. If you made an offer that wasn’t accepted, please understand it may be wanted or needed and simply came at the wrong time. Don’t be offended or press for an answer. If the parent needs it, they will most likely return to it eventually. 9. “No” is a perfectly valid answer that people must be prepared to accept without justification or hurt feelings. The parents do not need added drama in their life and shouldn’t be forced to manage the emotions of others. 10. With all of the fears and doubts of such a diagnosis swirling in the parent’s mind, a mention of God’s Will can be a very slippery slope. While we are believers, religious platitudes were not extremely helpful and I can only imagine how such words would be perceived by someone who isn’t a believer. This list is not exhaustive and I can only speak for my family. I think you will find it interesting that while we experienced all of the above, not a single cancer family ever did any of them. Never. Next week I will give some suggestions of things to say when there is nothing to say. The one thing I hated people saying when I got my diagnosis was “be positive” and “stay strong”. Hmmm be positive about what exactly? And no there are days I just don’t want to have to be strong anymore I just want to cry. So true. We needed to curl in a ball and cry some more than we needed that. uggg! I hated those ones! Why be strong!?!? Why can’t I break down and cry every day!?!? My 8 month old baby had cancer! how can you be strong or positive about that! There is no way! You just have to cry, pick up the pieces and move on. This is good! But #3 is soooooooo spot on…and could probably lead to some serious falling out or even a good smack upside the head! Hugs to you all. My 7 yr old daughter is battling right now. This was Perfect! I would also add that you should not always expect a thank you. The amount of gifts received was overwhelming and often they came from people I didn’t even know. A few times people would repeatedly ask if I received the package or card etc. I try the best I can to thank as many people as I can but it’s almost impossible. So it’s disappointing when I feel some expected it. I think during this time if you expect a thank you, you probably should not give the gift. I pray your daughter is doing well. I totally understand the thank yous. That is overwhelming – there are so many nice people who send stuff it is impossible to keep up. I was only looking at the diagnosis time frame & remembering how hellish that was! Thank you for this post. I know that in our situation, our son diagnosed with osteosarcoma in March of 2014, many of these were true. I appreciated reading #2 because in their kindness people offered, “What can I do?” and I just couldn’t tell them….not because I didn’t need help. Your explanation helped to see why I felt overwhelmed and couldn’t assign tasks and think clearly. Spot on. Also I loved #4….since I’m an introvert, the quantity of words I can process is limited in any given day normally. One evening when I was sitting trying to enjoy our older son’s baseball game during the throws of treatment, another mom who knew of our situation prattled on about her aging and ailing mom to where I just couldn’t listen anymore. I felt mad at her for not being sensitive to my need to just enjoy the game without engaging in conversation about more health issues. This post helped me process some of why others and their words were hard. Thank you. My thought to the “What can I do” question is, just do, don’t ask. We will likely never tell if you do. I know people meant well with that, but at that point, there just is no answer to it. So true. And then there’s the “god only gives you what you can handle.” Still surprised I never took a swing at one of these people. OH MY! I hate that one. I’m not sure it is even Biblical, but I certainly didn’t want to hear something like that with my baby in a medicated sleep in a hospital bed. Mark, I recently told one of my friends that I would love to know how to best respond to people experiencing great suffering. Thank you for this post. I look forward to the next one. Stay tuned! I hope it helps because i understand the stress of not knowing what to say. such good advice – when I came home after my near-fatal stroke – I was often stressed by people who needed me to explain all the technical stuff – which was hard – since I didn’t really understand it myself -much less remember most of the ordeal. God bless you for the entire experience with Kylie – now you can be a blessing to those of us who would otherwise be ignorant and possibly cause more harm then good – despite our best intentions! Yes, I understand how uncomfortable people are around us at times. No one knows what to say, but there are some triggers (obviously). and you are right, most have good intent, it is hard! Hey Mark. I never feel right, nor good saying much of anything. I don’t want to be patronizing, nor add to what is already enough in their lives. My favourite words to say in times like these are, “there are no words”. If the person is a close friend or family member, I would offer to help in any way at all, and I may make food and stuff to bless them with. But I wouldn’t want to be ‘in their face’. I hope and pray that you and your family are doing well. There is nothing to say sometimes. Next week, I will work on that. Thank you for writing this. I only wish I could have read this years ago , or at least had another parent that understood what we were going through with my 3 month old son. He was diagnosed with a rare brain tumor in 1985 ( he was 47th in the world with this type) .We had another son in 5th grade and one in 1st, and tried our best to keep their lives as normal as possible. The friends that were closest to us never had to ask what we needed, they just knew keeping our other 2 boys safe, and fed would alleviate some stress. These friends also became the “go to people ” who organized play dates, food drop offs, rides into Dana Farber, etc.it was a long 3 years of surgeries, chemo, radiation and dr visits. We are now celebrating my sons 30 birthday. We are blessed because this kiddo wasn’t supposed to even reach 1 year old. Speak from your heart💕…that is what we all need. Thank you! Those people who just “do” are special people. God bless them. Thank you for taking the time to share this information. It is helpful to me as you know. Please know your family is in our hearts and prayers everyday. So much I need to say to you but will save that for a time when we see each other. Fall semester-Oglethorpe-move in day. Will be fun and praying Kiera will be there! I did not write my last post correctly. I apologize, have some Kennedy issues going on. There is much we can speak about regarding your post, which was eye opening. That can wait until another day. We were blessed by so many people, whom I refer to as the silver lining in the fight. As a single mother, friends took Keaton into their home and treated her like their own (my biggest concern). You are right, those who offered to help rather than asked what you needed made things easier. I hated asking for help. I’m guilty of doing this very thing, asking rather than offering. I should know better. Thank you for reminding me of the difference. I didn’t take it wrong at all. Asking just makes if very hard. I had so many people line up to do something and I couldn’t put them to work. Thank you so much for this post. I am a childhood cancer survivor, and I know my parents went through so much for me. It’s been 19 years since I was diagnosed, and we still get people who try to equate their own life experiences into ours. And I absolutely HATE when people tell me I’m brave. Brave? What’s brave about sitting in hospital bed, enduring medicine that nearly killed me? Bravery is not even close to what I am. I am a SURVIVOR!! Congrats on being a survivor. People don’t know what to say. I get that. These rules can apply in many situations. My dad died when I was 12 after he was electrocuted on a job, and I always hate when people try to compare that grief to something they have faced or are facing. My husband’s dad died from cancer just a year after mine did, so in some ways we understand, but it’s two very different circumstances still. Anyways, this was very on point! Thank you for writing this since not many people seem to understand. Thank you. I’m sorry for your losses. We will get to what to say soon. Eye-opening post, thank you for sharing! Thank you so much for writing this Mark. It was so helpful to me and I know many others. 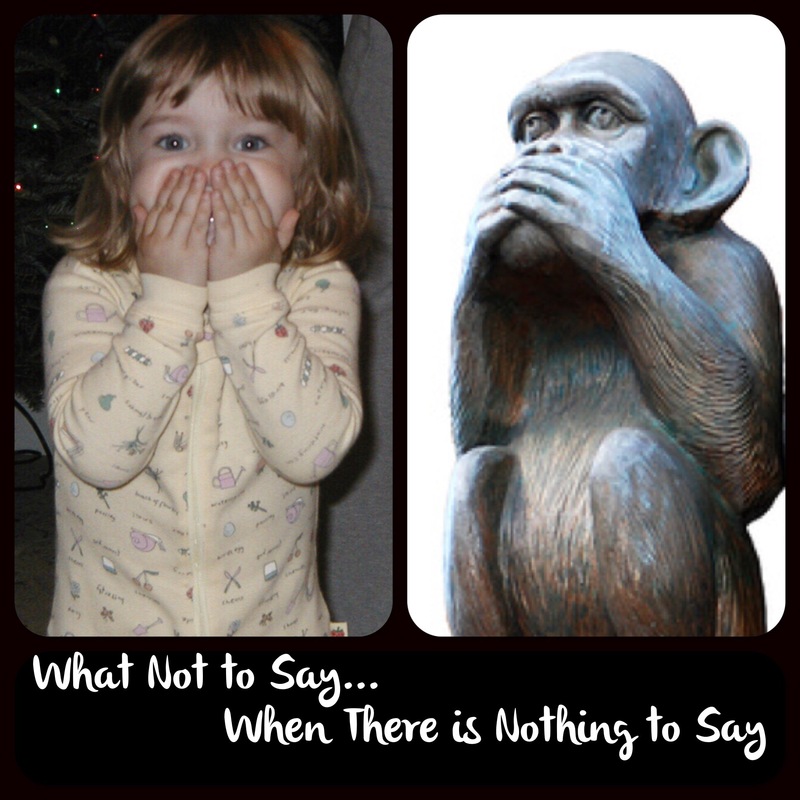 I am looking forward to your post on “what to say”! Yeah, now there is pressure. Haha. You never know how many people will read a post. I’m sorry but most of these seem rude and ungrateful… from a mother and father who are facing a life threatening illness for 5 years alone….having even one person to show concerns would be nice. Be thankful you have people who care for some parents face these battles alone. I’m sorry, Tabitha. I didn’t mean them to be ungrateful. We come from large families and had a ton of people to manage. I can only make observations of what happened to us. I’m sorry you feel alone in whatever situation you are in. I pray that changes. This is a must read for all us who wish to offer words of comfort. We have not ever met but somehow in this crazy inter-connected childhood cancer world, I became acquainted with you and your family’s story. We, too, are members of this community and it will be 5 years that our daughter, Eloise, passed away from rhabdomyosarcoma. This posting struck so many chords that I simply had to reach out. Firstly, I am so very sorry. And I say that with all candor and honesty that only another parent that is standing in similar shoes can truly understand. In this 5 year span, I have attended most of the advocacy events – am very involved with Curesearch and now serve on their Board as a childhood cancer advocate. I live and breathe to hope that the upcoming research will be the key to the cure. Thank you for connecting. I am sorry for your loss. I don’t know much about Curesearch, but will have to check it out as we find our place in the fight. Maybe we will meet at an event. We will be at Curefest. Chances are that our paths will cross at one of these events. I have met some remarkable people/families along the way. We all can truly say that we understand how each of us feels and with that comes a level of supportive compassion. I really appreciate #6, we had a pastor whose family was going through a difficult time and he asked the congregation to not attempt to start a relationship with their teens if there wasn’t one already in place. I thought this was so wise of him to protect his children from onlookers. Yes. Agreed. Most people have the right motives, but some want to be involved when they weren’t involved before. It gets hard to separate. I’m just catching up to your life. My sister told me about your story, family and blog. I have a sick feeling in the pit of my stomach after reading all the above and just want to say – my feeling is that people lack humility. People think they’re so important and make things all about THEMSELVES in situations like this. I honestly don’t know how you don’t just look at them and say – shut the eff up. I think that the people who are so irritating with their stories of comparison and trying to help aren’t your true connections to peace in this life anyway and can you only imagine how they would turn on their heels and move on if you did said that? But I would NEVER say what I would do when I haven’t been through an ordeal like your own. I’m so sorry for what you have endured and felt compelled to share my thoughts. Thank you Stacey. You capsulized exactly what I’ve thought when listening to some people. But I was mostly silent. People are so uncomfortable that it is palpable at times. So, in a way, I’ve felt sorry for some who stammer through their words. We did have to walk away from one person though. It was the best choice. I tell people now, don’t ASK, just DO! Find otu where they shop, get a gift card for the grocery store, coffee shop, CVS, etc……..just do SOMETHING!